It’s no surprise that people have started calling Beds on Board the “airbnb for boats”. We love airbnb. We use the platform to stay in amazing properties. We use it to rent out our own properties to guests from all over the world. We love the sharing economy. Websites that connect people that want something with the people that have it. These platforms are changing the way people travel, work, park, fix things and look after their pets. We love boats. We’ve been lucky enough to grow up on them. We have used them for work and for fun. We’ve lived in areas where they are a central part of daily life. We also love 3’s (it’s the magic number after all). Therefore, putting these all together to start Beds on Board and letting people stay on boats in amazing locations around the world was a natural thing. You can read why you’ll love staying on a boat here. So the “Uber for X” is an easy way of describing an idea by way of comparison, so Wag is the “Uber for dogs”. Now, our vision for bedsonboard.com isn’t about dull tasks. It’s about exciting new experiences for guests and letting boat owners make the most of their boats. It’s also about new people meeting each other. Being compared to another Silicon Valley giant is great because it helps our customers understand what we do. When the Daily Mail or Huffington Post say Beds on Board is like “airbnb for boats” people can picture our service clearly. We let people sleep on boats as alternative accommodation. We aren’t the only company that have been described as the “airbnb for boats”. We’ve seen this used for a few sites like Airbnb. Some even describe themselves that way. However, they are all for boat charter. Chartering is the traditional way to holiday on a boat. Hiring the boat and a captain and sailing from place to place. We love chartering (that makes 4!) but Beds on Board is different. It’s a way to enjoy boats and marinas and the lifestyle without the higher costs and commitments of chartering. That means we help get new people into boating for the first time. We also help people who love boats just stay on them. Maybe even on the stopover night before a charter holiday. Airbnb accommodation doesn’t move. Nor does Beds on Board accommodation. So when we are compared to our friends at Airbnb by the BBC, we think they are bang on! Of course, not all our customers know Airbnb, or alternatives to Airbnb. So the comparisons only go so far. Mark Twain said that “comparison is the death of joy” and while that may be a touch extreme, we are proud to be different. But how? We are different because we are specialists. We only offer boats. Our customers are only ever searching for boats. Our owners only ever rent boats. We are also experts. We know boats and marinas. We know what’s needed to have a safe and fun time on and around the water. We aim to be the world’s leading boat accommodation platform and in doing so we are proud when folks call us the “airbnb for boats”. 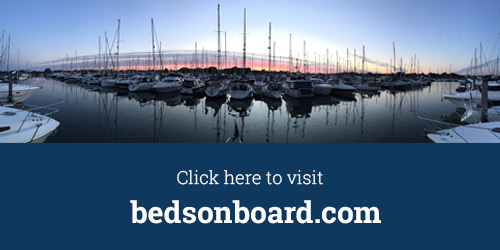 To find out more about staying on a boat and enjoying on water accommodation, visit bedsonboard.com today. It’s free to become a member.